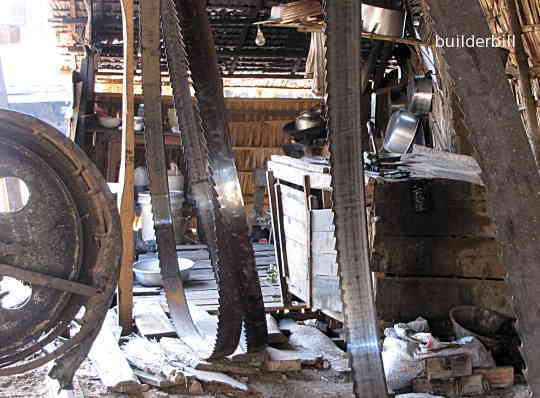 A continuous steel toothed blade running between two large pulleys, one of them power driven. A bandsaw blade specially made for cutting frozen meat. The heat treated teeth make it ideal for cutting laminates and plastics. A re-saw in a Vietnamese boat building shop. Travelling around the Mekong Delta in Vietnam I came across many of these large horizontal band saws in boatyards that were building traditional timber craft. Another shed with spare blades on show. In my experience large saws like this are fairly common but they are invariably have an upright or vertical orientation. Saws with blade sizes like this 6" to 8", 150mm to 200mm are called band re-saws. 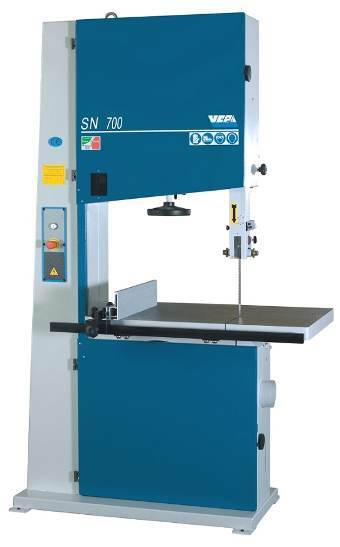 The majority of band saws today in small joinery and home workshops range in size from very small for model makers to up to about 36" or 900mm. The size refers to the the diameter of the pulley, so my old 36" Robinson would be able to cut a circle of say 34" radius. That is I have to deduct a touch for the guard around the enclosed section of the blade. Just because they are great for cutting curves, do not think this is all that band saws are used for. They are very handy for lots of small sawing jobs. They are used just as much for cutting straight as for cutting curves. One advantage of a band saw over a circular bench saw is the thin blade width. Ripping up strips out of sheet material quite often gives an extra strip or two than if a TCT bench saw was used. 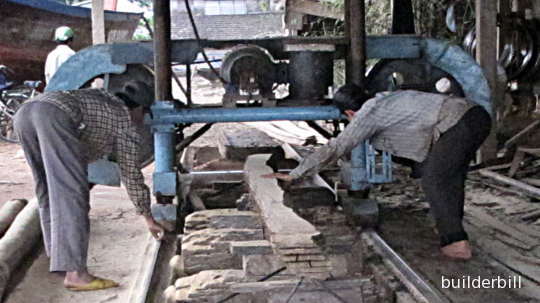 The photo above is a typical example of a modern small shop saw. At a guess it is around 30". The bottom wheel is the one that is driven and the top one is an idler. It has modern guards around the moving parts. It has a standard height working table with an adjustable fence. The gap between the table and the top support for the blade is known as the throat. In the photo the gap looks to be about 10" or so. The throat is adjustable and should always be set just higher than the material being cut. The top support contains a ball bearing race that the back of the blade rides against and it is essential that it is kept well maintained. The machine has a light and modern safety on off switches and it will have some provision for dust extraction. 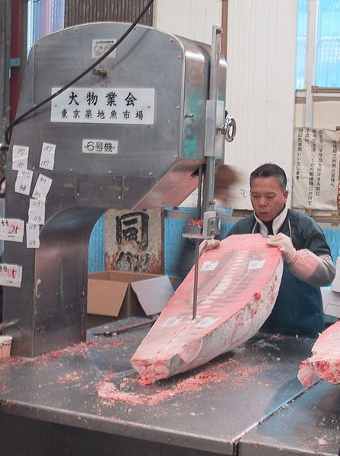 Cutting up a frozen tuna. Photo thanks to Wikimedia Commons, User: Chris 73. The food industry has long used band saws and as a result they have provided a service to the general joinery trades in that the blades developed for butchers work very nicely for cutting laminates and plastic, The blades are typically quite narrow, saw less than 3/4" and the tips are heat treated for longer life.